William Henry Vanderbilt’s idea was an interesting one. He would erect three near-matching homes, one for himself and wife Louisa, and two for his daughters, Margaret and Emily. (Margaret had married Elliott Fitch and Emily was now Mrs. William Douglass Sloane.) John Butler Snook is routinely credited with the design of the harmonious mansions, since his name appeared on the plans filed with the Department of Buildings. He may be getting more credit than is deserved, however. That argument may never be settled; however two years after construction began, the Triple Palace at Nos. 640 and 642 Fifth Avenue, and No. 2 West 52nd Street, was completed. Vanderbilt had originally envisioned the grand Italian Renaissance palazzos clad in gleaming white marble. In the end, the less glamorous brownstone was used instead. Some historians feel that an aging Vanderbilt changed his mind when he realized that he may not have that many years left to enjoy his house. Using the easily obtainable brownstone would significantly speed the construction process. More than 600 construction workers and 60 European sculptors and craftsmen had labored on the triple mansion. William’s and Margaret’s homes were entered via a common centered courtyard. Emily’s entrance faced 52nd Street. The daughters’ homes, sharing a plot the same size as their father’s, were necessarily about half the size of their parents’ 58-room house. For occasions of elaborate entertaining, their adjoining mansions were constructed so the drawing rooms could be opened into a single, enormous ballroom. Unlike William Kissam’s and Cornelius’s chateaus with their towers and turrets and ornamented gables; the houses of the Triple Palace were restrained and dignified in comparison--which is not to say they did not abound with ostentatious decoration. As the mansions neared completion in 1881 Vanderbilt addressed a potential problem. He would have no stumbling of dainty feet on the paving stones as high-class visitors moved from their carriages to the entrance. On August 6 The New York Times reported that “What is claimed to be the largest pavement stone ever quarried in the United States, is now resting upon blocks in front of the main entrance of William H. Vanderbilt’s new house.” The 25 foot, 2 inch long stone was 15 feet wide and 8 inches thick. It weighed over 22 tons. With no seams between his paving stones, Vanderbilt did not have to worry about embarrassing and dangerous tripping. The families moved into the homes in January 1881; although they would not be totally finished until 1883. Work on furnishing the mansions and completing the ornamental details would go on around the Vanderbilts’ home life. By March 1882 Henry and Louisa felt the mansion was guest-worthy and a housewarming party was held. Two thousand invitations were sent out by liveried messengers. The guests that night entered through the covered double vestibule with its mosaic-encrusted walls and stained glass ceiling. They turned left into William’s doorway and entered interiors intended to astound. Carved woodwork was inlaid with mother-of-pearl ornamentation; the painted ceiling of the 45-foot long dining room was done in Paris by E. V. Luminais; and the Japanese Room was designed by John La Farge. Herter Brothers, the preeminent furniture and decorating firm of the day, was responsible for the interior design throughout, including the custom furniture and built-in cabinetry. In December 1883 the art gallery was ready for showing off. Vanderbilt sent out 3,000 invitations to “an art reception” and on December 21 The Times reported that “More than 2,500 gentlemen promenaded the parlors of William H. Vanderbilt’s house.” Considering the large number of visitors and the high value of the bric-a-brac in the mansion, Vanderbilt had a crew of 11 detectives roaming the crowd. It was a good move on the millionaire’s part. “They recognized one man in the crowd whom they knew came without invitation, and he was shown to the door. Early in the evening a few ladies made an attempt to join the company. They were politely ushered out," reported The Times. At the time of the entertainment, Vanderbilt’s health had already begun to fail and was under the care of a physician. “He had no definite conception of what trouble he was suffering from, though his greatest annoyance came from indigestion,” said The New York Times later. On December 8, 1885 Vanderbilt rose as usual, at 7:00. He went about his usual business, including a visit to the studio of sculptor J. Q. A. Ward to sit for a bronze bust. The day continued as normal with Vanderbilt in the best of spirits and seemingly the best of health. At 2:20 that afternoon he said in his private study chatting with Robert Garrett, President of the Baltimore and Ohio Railroad Company. “Mr. Vanderbilt was speaking, when suddenly Mr. Garrett perceived indistinctness in his speech. The next instant the muscles around his mouth began to twitch slightly. Then they were violently convulsed. I another moment the great millionaire’s arms bent under his body, he toppled forward, and pitched headlong toward the floor,” related The Times the following day. Within five minutes of the massive stroke, William Henry Vanderbilt lay dead on his study floor. Cornelius and Frederick sat overnight in Vanderbilt’s bedroom where the “body of William H. Vanderbilt, the richest man in the world…rested all Tuesday night in an ice box in his bedroom, which is the second story front room of the Fifth avenue mansion.” Earlier that day undertaker W. H. Billier fastened rosettes of crepe bearing black silk streamers to the electric bells of the Fifth Avenue and 51st Street entrances. “The white curtains of all the windows were pulled down, forming a striking contrast to the rain-soaked brownstone walls,” commented The Sun the following morning. Among the few admitted to the death chamber other than family members was John Quincy Adams Ward. The sculptor took a cast of Vanderbilt’s face. “He said it was a very successful one, and that with its aid, and with photographs he would be able to complete the bust without difficulty,” said the newspaper. As with all up-to-date mansions of the 1880s, there was an Asian-themed room. 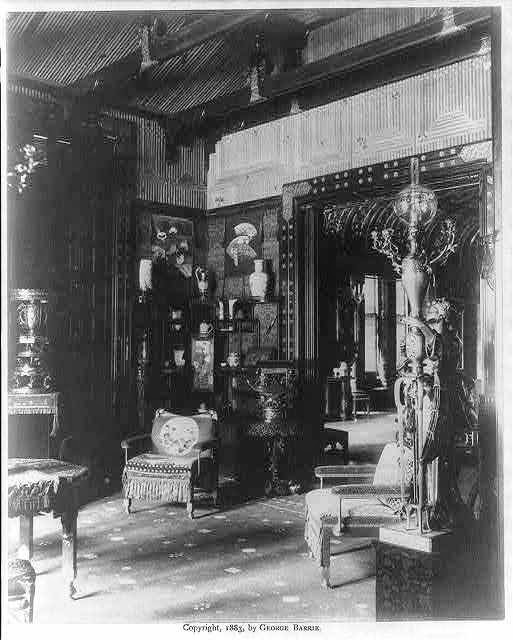 In the Vanderbilt house a reeded ceiling and upper walls, Japanese fans and Oriental bric-a-brac created the ambiance. 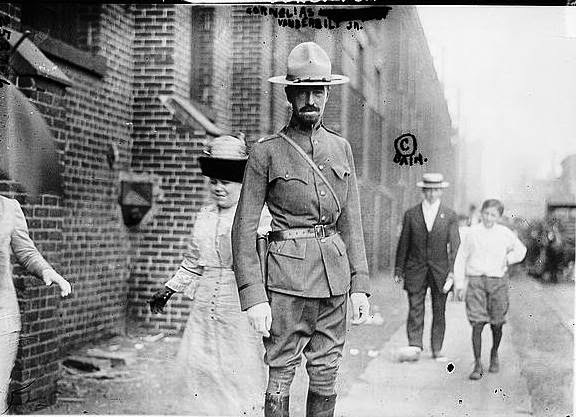 photo from the collection of the Library of Congress. The order of the 15 carriages that pulled away from the Vanderbilt mansions was directed by social protocol. “In the carriage first following the hearse were Cornelius Vanderbilt and wife, with George Vanderbilt. In the second carriage rode William K. Vanderbilt and wife. The third vehicle contained J. S. Webb and wife, the fourth Mr. and Mrs W. D. Sloane, and the fifth Mr. and Mrs. Twombly.” And so on. A detachment of 180 policemen kept the crowds around the church at bay. Vanderbilt’s will was read two days later. He had earlier told his family “The care of $200,000,000 is too great a load for any brain or back to bear. It is enough to kill a man. 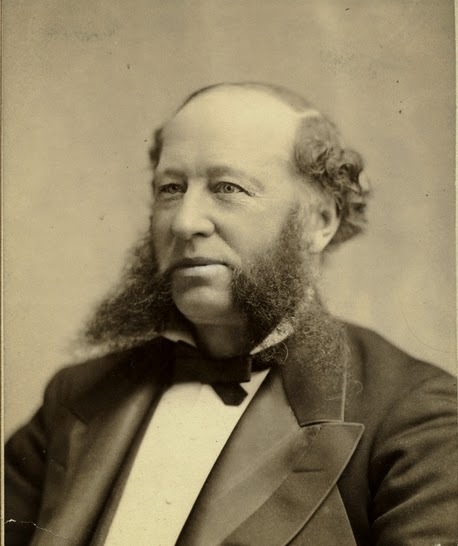 I have no son whom I am willing to afflict with the terrible burden…So when I lay down this heavy responsibility, I want my sons to divide it, and share the worry which it will cost to keep it.” And indeed the will divided Vanderbilt’s massive estate nearly equally among his children. As for Louisa, she got a life interest in the Fifth Avenue mansion and an annuity of $200,000 and $500,000 “for disposal by will.” She remained in the house and “At her death the residence and works of art are to go to George W. Vanderbilt, and at his death to his eldest son, or, should he not have a son, to William H.; or Cornelius, sons of Cornelius, according to their survival.” Vanderbilt was determined that his mansion and its artworks should remain a Vanderbilt house, “it being the purpose of the testator to convey them to a male descendant of the name of Vanderbilt.” As for the other two mansions, “His daughters are given the houses in which they live,” said The New York Times on December 13. In 1894 Munsey's Magazine published a charming illustration of the Vanderbilt homes -- copyright expired. It would be among the last great events that Louisa Vanderbilt would see. Exactly a year later, on November 9, 1896, the Vanderbilt mansion was hung with black crepe. 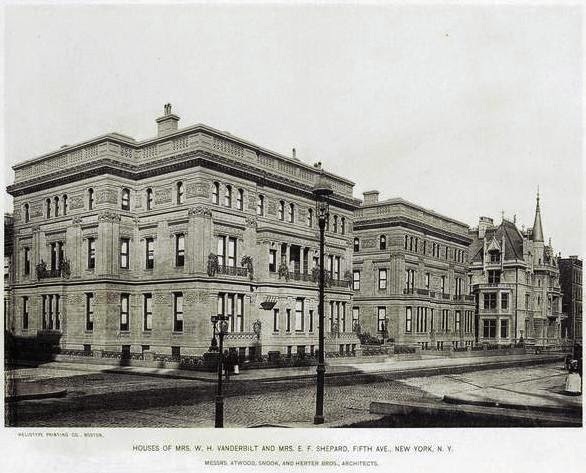 “The residence of Mrs. Vanderbilt, at the corner of Fifty-first Street and Fifth Avenue, where the body lay, was besieged all day yesterday by friends and acquaintances of Mrs. Vanderbilt, but her sons denied themselves to all except close friends,” said The Times that day. Eighty “well-known and fashionable people” filed into the mosaic-paved inner court. To ensure that they did not mistakenly turn to George’s mansion, Margaret stationed “a retinue of liveried servants…in the Sloane side of this court.” The Times said they “formed a human path through whose rows of dark plush breeches the prospective revelers might find their way.” Emily’s and Margaret’s drawing rooms were thrown open “and a better ballroom was thus secured than the Sloane picture gallery would have made,” said the newspaper. In 1905 George negotiated a 10-year lease on No. 640 with Henry Frick. 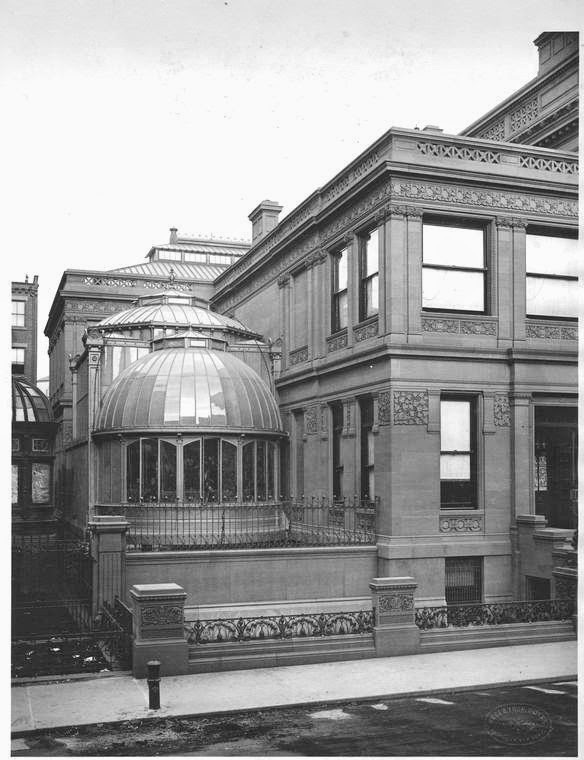 According to The New York Times later, Frick “spent thousands of dollars in alterations, eliminating the garden in front and adding a massive entrance.” The steel man paid $100,000 in rent, “making this Vanderbilt house the most costly private residence under lease in the city,” said The Times. Frick could afford the rent. In 1910 he hung Frans Hals’s “Portrait of a Woman” on the wall here. He paid art dealers Knodler & Co. more than $140,000 for it—about $3.3 million by today’s standards. 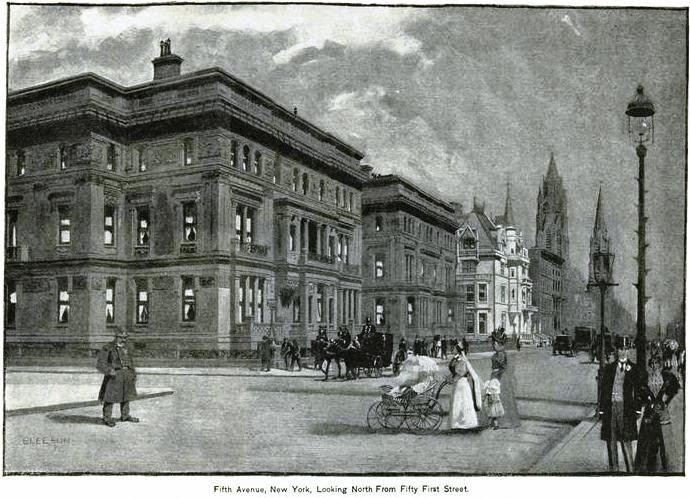 By now the grand mansions of this section of Fifth Avenue were being converted for business or simply being razed. 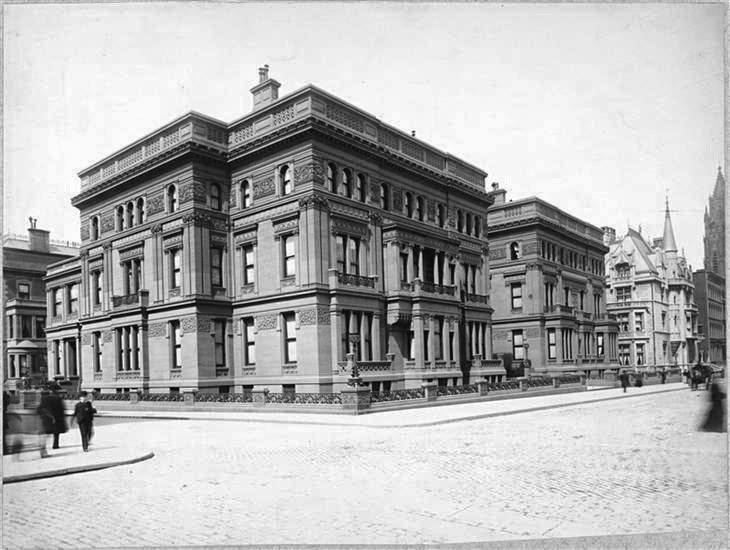 When Henry Frick moved into his new white marble mansion further up the avenue, Cornelius III took over No. 640. 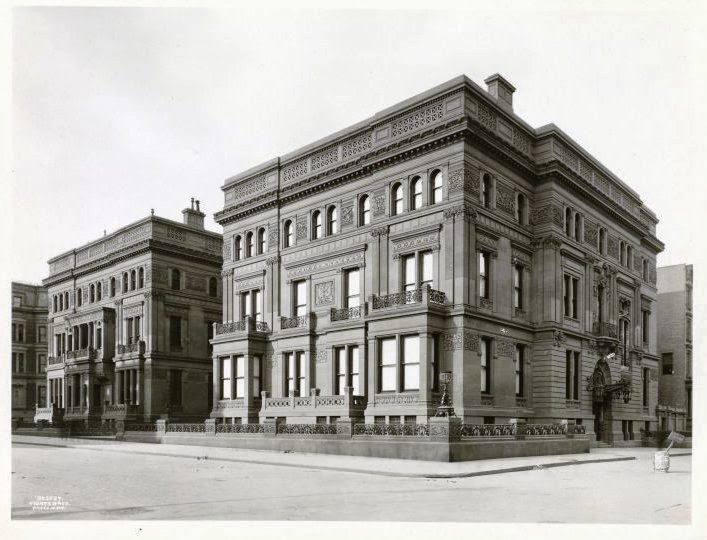 By 1927, when his father’s massive chateau at 57th Street was demolished, there were no Vanderbilt mansions left on Fifth Avenue other than 640. But Cornelius III and his wife, Grace, stubbornly stayed put. Cornelius, a brigadier general, was highly interested in military matters while Grace focused on entertaining and charity events. Eventually surrounded by business buildings, the couple spurned all offers from developers. And in the meantime, they entertained not only the highest ranks of military and society, but royalty. In 1919 the house was crowded with European titles and wealthy socialites as Grace gave a reception with music for the Queen of the Belgians. In 1927 it was Prince William of Sweden who was the guest of honor at a reception on January 9. And in 1927 1,000 guests and a “fleet of officers” were entertained in honor of Rear Admiral Charles F. Hughes. Cornelius Vanderbilt III died on March 1, 1942. Although he had sold the Fifth Avenue mansion to William Waldorf Astor estate in 1940, he and Grace remained living there until his death. Now Grace was forced out. She moved into the William Starr Miller house at No. 1048 Fifth Avenue. On November 22, 1945 The New York Times said the mansion “is fast being demolished by wrecking crews preparing for the erection of a commercial building on the site.” Three weeks earlier the house had been opened for a public auction of the rooms and interior decorations. Since then buyers had been removing mirrors, paneled walls, chandeliers, inlaid floors, and mantels. “Paramount Pictures, Inc., paid $3,500 for the carved panels, mirrors and other fixtures of the ballroom, $975 for those of the dining room and $1,250 for those of the study,” reported the newspaper. 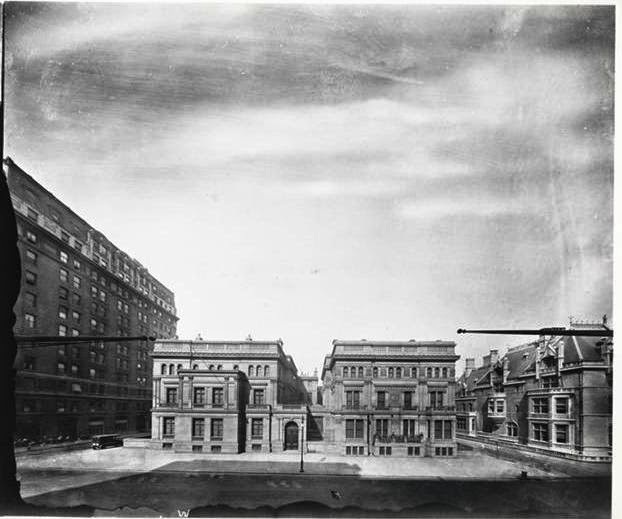 Within days the last of the great Vanderbilt houses on Vanderbilt Row was gone. The stunning and opulent interiors alone must have been mind boggling to behold for anyone lucky enough to get past the entry doors. The later 20th C. renovations not only streamlined the exuberant brownstone exterior carvings but also unfortunately eliminated all the eye catching, over the top, but outdated mother of pearl, mirrored, heavily carved, glazed and gilded high Victorian interiors. If only one of the cluster of Vanderbilt palaces on 5th Ave had survived, sigh. The alterations that Grace and Cornelius III made to the house both inside and out under the direction of Horace Trumbauer (I believe) are a fascinating 'bricks and mortar" example of how substantially the taste of the rich had changed in the 35 or so years since the house had been built. It is alo interesting to note that the contents of William H.s picture gallery of which he was so proud were, for the most part (and with a very few notable exceptions), viewed as bulky trash by future generations, and most of it remains, to this day, decidedly "out of fashion". Sic transit gloria mundi. Further to my previous post- while William H.s interiors are greatly admired by historians today for their quality, enthusiasm and inventiveness, and furniture from the house commands six figure prices on the rare occasions it makes an appearance in the sales rooms (probably origionally rescued from a dumpster during Grace's remodelling of the house), the Louis XV and XVI style furniture favored by Grace is hard to even give away today. William H's paintings, however, seem resolutely to resist a return to favor. It seems that a substantial amount of the original furniture stayed in the Vanderbilt family, parceled out to various relations. George took a fair amount of the fixtures to Biltmore House, including light fixtures and windows (some of the built-in dining room cabinets from this house can be seen at Biltmore in the 3rd floor living room and the "Halloween Room", a large space in the basement decorated for entertaining in the 1920s) and many others have turned up at auction over the years, consigned by Vanderbilt descendants. I doubt all that much of it got carelessly trashed during the Grace's remodeling; always a bit hard up for cash, she probably sent the bulk of it to auction herself. Unfortunately with mid-Manhattan booming into a premier commercial district, no one at that time thought preservation was warranted for any of the magnificent 5th Ave mansions, some barely 40-50 years old. At the height, how amazing was the view up from AT Stewart's marble townhouse at 34th or down Fifth from the Cornelius Vanderbilt II palace at 58th? The tiny glimpse here at the original Henry Vanderbilt interiors, almost difficult to imagine the expense and craftsmanship that went into the ultra-luxurious appointments, makes their loss very unfortunate. New York and the US destroy everything. They don't preserve anything. It's criminal. If it weren't for Jackie Kennedy Onassis, Grand Central Station would have been torn down.....and I think the Vanderbilts had something to do with that building as well as they were the Railroad people. The street next to Grand Central Station is called Vanderbilt Avenue. did anything from these mansions survive?